These quotes leave many questions unanswered, and these have preoccupied theologians from the earliest times. Why did the angels revolt? From what hierarchical level did they come? How many were there? Where did they end up after being cast from heaven? I'll look at these topics below. 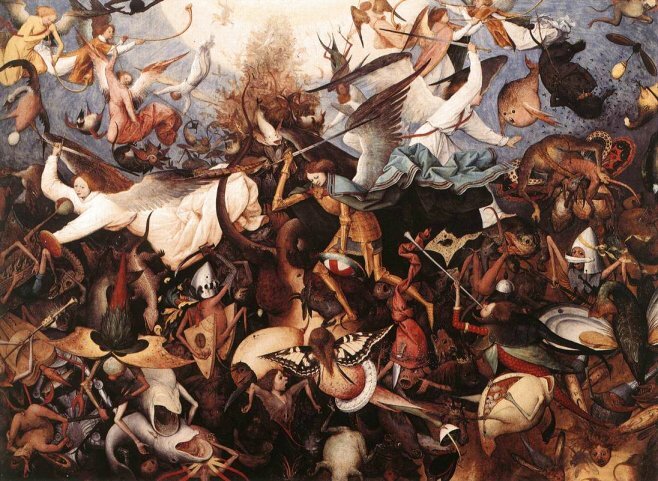 There are a number of images in art of the fall of the rebel angels, but nothing I know of can match Breugel, so I'm going to settle for that. I do suspect that Breugel rather enjoyed himself when painting this. St Michael, centre, with help from other angels, is dealing with a variety of fallen angels, including fish-like ones and a rather beautiful one that looks like a butterfly. The angel at the top left with the trumpet is probably Gabriel, as that is an attribute of his. Why did the angels revolt? Lucifer could not accept that he would have to serve humanity, or indeed Christ incarnated in human form. Images of the Coronation of the Virgin, with the human Virgin centre stage surrounded by subservient angels, would not have pleased Lucifer. The number, seniority and individual function of the fallen angels has obsessed theologians, professional and amateur, since the earliest of times. King James the First wrote a treatise called Daemonologie on this subject. He divided the demons into four categories. The French Dominican Sebastien Michaelis got into conversation with the demon he was exorcising from a nun. The seemingly rather chatty demon told him that, like the angelic hierarchy, there were nine categories of demons in three hierarchies; this particular demon came from the lowest category. Sebastien write it all down in the appropriately titled Marvellous History. As to how many there were, the learned fifteenth century Spanish Friar and Bishop Alphonso de Spina calculated the number to be 133,316,666, representing one third of the original angelic host. You may well feel that this is all nonsensical stuff with no basis in the Bible or serious theology. What it does illustrate, though, is the fascination, or even obsession with the subject throughout history. Where did the fallen angels end up? Heap on himself damnation . 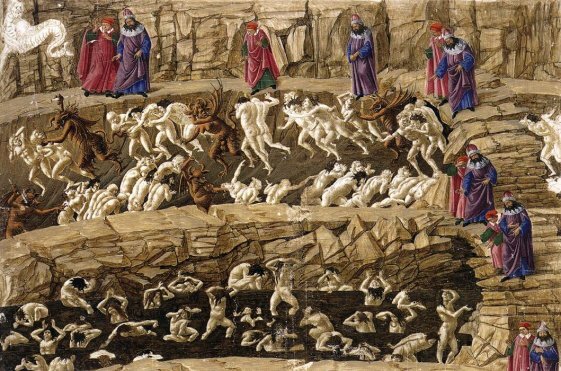 . .
Hell with all its delights is frequently portrayed in Christian art up to the Renaissance. I have suggested elsewhere that, while it might have been terrifying to contemporary audiences, modern viewers tend to regard them with amusement, inured by horror films. 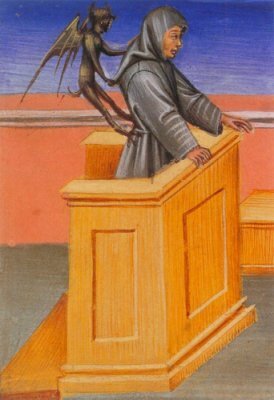 I do suspect though that some of the artists rather enjoyed exercising their imaginations in finding different ways to depict devils. 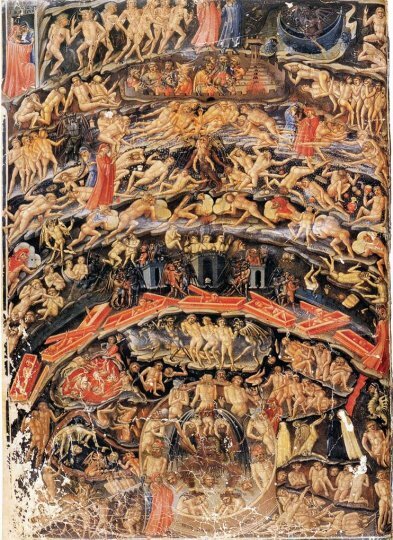 There will be a selection of Hellish scenes when I look at images of the Last Judgement. I have discussed Christ's Descent into Hell here. the two images below are inspired by that other great poet who tackled Hell, Dante. This provided artists with many opportunities. Among the best are paintings showing the temptation and torment of Saint Anthony Abbot. I have written about those images here. 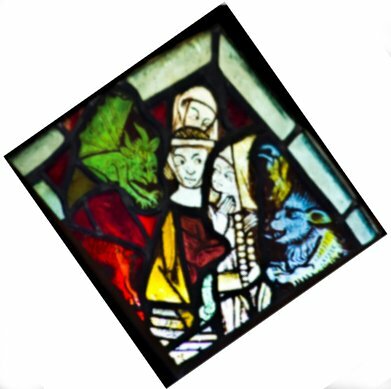 Here are two far less grand images showing devils up to mischief. Giovanni di Paolo's Illumination (left) is entitled 'Heresy' and we see a devil whispering into the preacher's ear. The stained glass window (right) comes from the church of St Nicholas, Stanford-on-Avon, Northamptonshire. Is is called 'a warning against idle gossip'. The two gossips clearly haven't noticed the devils. Are they encouraging the women to gossip, or is this a warning about what will happen to them if they don't stop? This isn't an easy passage to interpret, but some suggest that it tells us that fallen angels came to earth and had their way with beautiful women, sometimes thought to be the daughters of Cain. The result of this was the birth of giants, known as Nephelim. God was so outraged that the Flood was initiated. Understandably, this story, which has echoes of the mythological tale of Uranus and his association with Gaia, producing the Titans, does not generally feature in religious art.